Last week's Unravelling assignment was to photograph memories. I decided to rummage through old photographs of my mother and grandmother. After the photos were developed I realized I didn't do what was asked...I was supposed to photograph MY memories. But, I still liked the results and wanted to share. 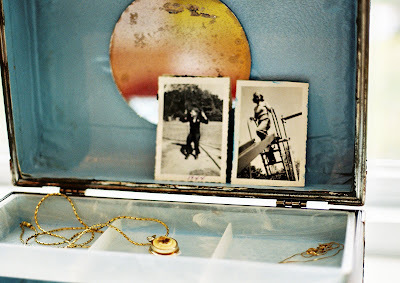 Plus, it was great to re-capture these photos with special items like my grandmother's necklaces and vintage gloves. My favorite photos were the cute and playful pictures of my grandmother on a slide and my grandfather on a swing. I also love the white book filled with photos of my grandmother and a lock of her hair. She gave that book to my grandfather before he went to World War II. In the last photo my Mom is holding a picture of herself with my great grandmother...such a sweet moment. I had so much fun documenting these wonderful memories! As far as photography...ohh I'm still learning. I feel like I have little control over the camera and settings, which results in blurry and dark photos. The learning curve can be fun because I never know what to find in the one hour envelope, but also frustrating when the photos don't come out! So, we'll see...I'll keep learning and experimenting. These pics are wonderful, and your photography skills are top notch. Your images always have a softness to them I just love. Keep it up! These absolutely bring a (smile) tear to my eyes and I can feel the welling up in my eyes. I love the photo with the gloves! i agree with jude and think the photos are wonderful. 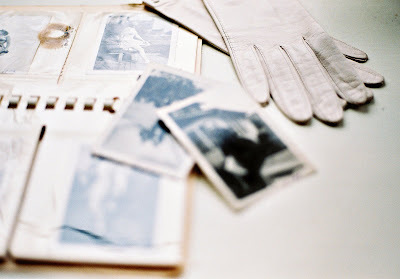 you've included so many lovely items that conjure up memories from three generations. and, they are your memories now, especially that last one. very special. Diana, I think these are wonderful photos! When I first started looking at them, I thought you were once again sharing another photographer's work. But, these are your and they are great. Keep at it! they are Lovely! the last one is truly stunning! Oh, those are all beautiful! I love your styling. So glad that you shared these. Nostalgia is always an inspiration! That is so great Pleasie. There is nothing more tender to the heart than old photos. Love the whole vibe in the pictures. It's so neat that you're doing the Unravelling assignments. I love this post. I think you're doing a great job with your photography. If you're having trouble with "dark" photos have you tried adjusting the ISO in low lighting (turning it up) or just post-processing, increasing the brightness? these are truly wonderful, diana! ps sontag's on photography is a fascinating read. i think your shots are fabulous. and i am a total dork and i love how the first pick looks so well below your header. perfect! Wow - these photos are wonderful! I love the new and old feel they give. As if, me as a viewer is peaking into someone's memory of their past. The photos bring depth! Looks to me like the results of your "experimenting" are pretty darn fantastic. 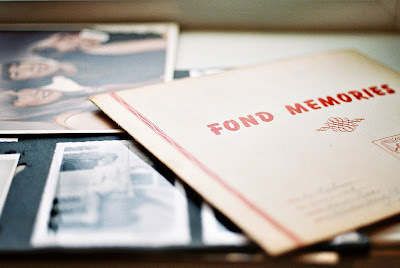 Those photos are sentimental and lovely and I really like the way you styled them...layer upon layer of meaning. Really, they are beautiful all around. Guys - you are seriously making me blush - THANK YOU!!! I love your photos of precious family photos! I have been wanting to blog about some photos I have of my grandmother from the same era and this post just inspired me to think outside of the scanner and do it in a beautiful creative way. Thanks! Beautiful! I love that one with the gloves. And I think that family memories are your memories because you'll be the one inheriting them, right? You really have done a great job with these. I've been taking photos this morning for the site and I'm not sure how you have the patience to wait for film. I enjoy these posts about your class. Your photos are so beautiful and nostalgic. I think you did a wonderful job capturing your and your family's memories and special treasures. The last photo with your mum's hands holding a token of the past is quite touching. I love how these turned out. Old photos of loved ones are the best. These are great. 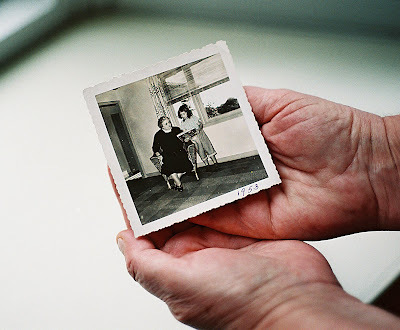 And I think they count as your memories, too - little keys to familial stories and beliefs that have swirled around as you grew up. The photos are wonderful! I think you did a great job!! Your photos are beautiful - the ones you took I mean. As for the others, what beautiful pieces to have. My heart goes out to all those who lost pieces just like this in the Victorian bushfires. It's my greeat fear. I have nothing like this is my house, it's all at my mothers - for some reason I still have a childish ideal that nothing bad can happen at her house. Gorgeous photos. Truly inspiring. 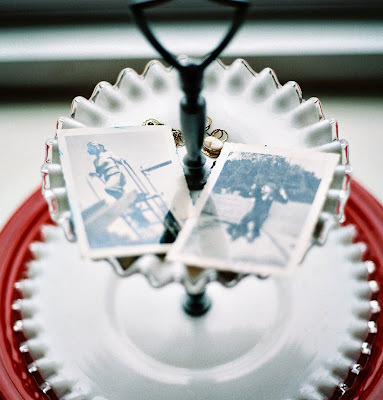 I love the idea of displaying old black and white pictures on a little jewelry stand, like the second pic. I just love going through old photos. These are gorgeous. The styling, the (old) photos, your point of view - it's all fabulous. And so is your blog! Thanks so much for visiting mine. Lovely post and beautiful shots. All of those items trigger your own memories of the people who were connected to them. Stories within stories within stories... wonderful! this post is so sweet--such a good idea. and such delightful photos. An incredibly poignant, honest post. Thank you. oh my! these photos are amazing, diana! you are so talented. lovely post. thanks for sharing. love your photography, mind if i ask what camera are u using? The truth of the matter is...those are your memories because you're made up of the fibers of those memories. Those memories lead to you. I think you are a great photographer, Diana. And these photos--and the way you captured them--are beautiful. I love the "I'm very much attached to you" Valentine heart. Wow! WOW!!! How special and these are incredible, Diana. Great job! these are wonderful :) you did a great job! 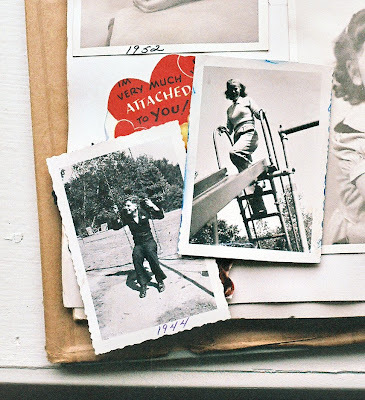 These images of your old family photographs are so heartwarming. I have so many of these black and whites myself and would love to display these creatively. Great job on the photos! I am LOVING these shots...the light and the composition are amazing. Great job!